The TIBO TI435 DAB+/FM Tuner is a simple to use and fully featured DAB+ and FM tuner with multiple preset buttons for easy access to your favourite stations. The TIBO TI435 DAB+/FM Tuner has 9 easily accessible presets, and the large display is equally clear and informative. To select stations a simple twist and push rotary knob makes it intuitive to use. The simple, logical button layout makes for a design that's clean and easy on the eye. The TIBO TI435 DAB+/FM Tuner is exceptionally well built, with a solid metal casing and fronted by an aluminium front panel that you'd usually only see on much more expensive tuners. 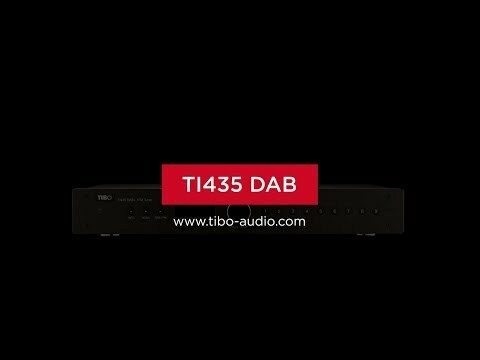 With both DAB+ (Digital Audio Broadcasting plus) and FM tuners built-in, the TIBO TI435 DAB+/FM Tuner is ideally equipped for listening to a wide range of stations. Select DAB+ and you'll be able to listen to the vast range of available digital radio stations in crisp, digital clarity, free from interference. For local stations or a more expansive sound with national stations then FM is also on hand. An included remote control is also part of the package.